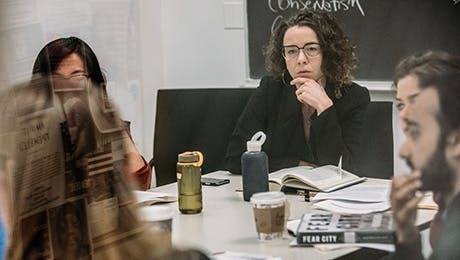 The academic traditions of criticism, theory, and critical writing all share an equal part in a rigorous MA in Creative Publishing and Critical Journalism. Here, students are immersed in New York City, the capital of publishing, with a variety of studio courses and work experiences. Learn how to design, edit, and distribute journals and books that contain intellectually serious work for modern readers. The Creative Publishing and Critical Journalism (CPCJ) master's program surveys traditional forms of book and magazine publishing while exploring the possibilities of new media, placing an emphasis on unorthodox and forward-looking forms. CPCJ broadens the lens of traditional journalism programs with its emphasis on design, contemporary print and digital publishing practices, and genres of cultural criticism, long-form creative nonfiction, and reflective writing that is deeply informed by rigorous critical theory and research. The master's program is aimed at a variety of students: writers and reporters who dream of becoming the next Susan Sontag or Glenn Greenwald; graphic designers who aspire to follow in the footsteps of Saul Bass or Milton Glaser; and editors who dream of starting a new intellectual quarterly to follow in the footsteps of affiliated faculty like Jonathan Baskin, the founder of The Point. Graduates emerge from this MA program with a robust portfolio of work and wide set of skills. Students don't just study big ideas, great books, and contemporary theories of media. They also learn how to use media, by learning the ropes of the New York publishing world, online and in print, up close and personal, through site visits, writing-intensive seminars, collaborative multimedia studio courses, and an individualized capstone project. Our curriculum surveys the dawn of the mechanical printing press through modern interactive design. Through seminar classes, survey the “worlds built by words” that first flourished in the Renaissance and continue to evolve in a brave new world of digital media, tweets, and social-networking.